Central park area on board Symphony of the Seas. From a shaded, circular bed-like lounger at the solarium aboard Royal Caribbean's Symphony of the Seas, it's easy to forget you're cruising on the largest ship in the world. Located at the very front of the ship, the two-story solarium feels more like an open yacht; the walls and ceiling are made completely of windows. A 360 degree bar sits next to a 20-foot tiled, reflective art installation on the upper level. Jacuzzis with see-through sides drop down to the lower level. The skywalk, an outdoor walkway with a transparent bottom, hangs out over the sea 15 stories below. And no kids are allowed. The solarium is one of the few peaceful places on an otherwise action-packed ship. And that's exactly what Royal Caribbean had in mind when designing Symphony of the Seas: something for everyone. "This is an expression of five years of listening to customers," said Michael Bayley, President and CEO of Royal Caribbean. "More art, more water features, more attention to detail." Symphony of the Seas is the fourth ship in the Oasis class from Royal Caribbean International, each of which has been infinitesimally larger than the last and could claim the title of world's largest cruise ship until the next was built. Longtime cruisers with the line will recognize many of the dining spots - Jamie's Italian, Wonderland, WindJammer - and adventure activities - Ultimate Abyss slide, zip line and the FlowRider surf pool. But many of the ship's non-architectural options are totally new. Most notable is the ship's original, multimillion-dollar musical, "Flight." The show starts 20 years in the future with a cutting-edge commercial flight to Mars. Then the cast travels back in time covering every milestone of humanity's relationship with flying, leaving many in the audience teary eyed at the end. Some people on last week's preview sailing recalled that it took them at least a minute to determine whether what they were seeing was real or on a screen (it's real!). "What they did with the show, the history. It was great," said Jeffrey Oropeza, 30, a travel agent from Houston. "Get first level middle seats. Trust me, it will be worth it." 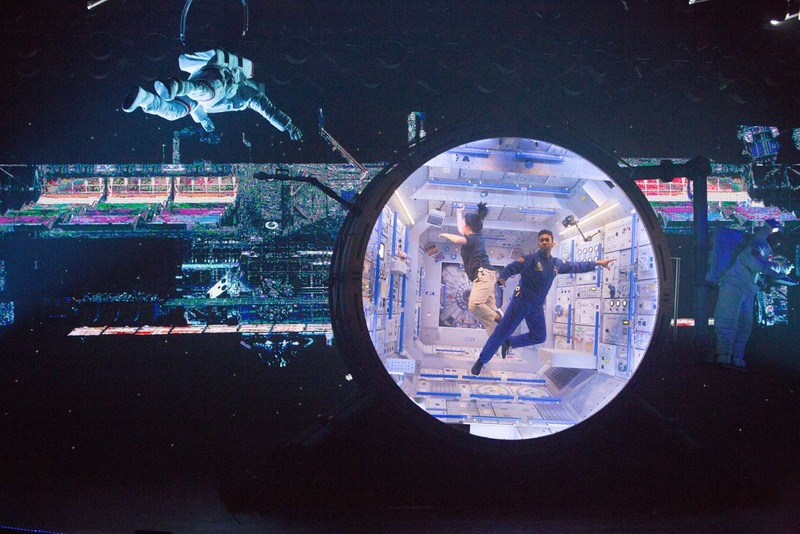 Royal Caribbean hired astronaut Clayton Anderson to advise in designing the space station used in the show. After last week's performance he told the head of entertainment that real astronauts don't wear shoes. Actors in all future shows will be shoeless. The Ultimate Family Suite on board Symphony of the Seas sleeps eight. The ship's ice show, "1977," is a high-tech continuation of a similar show on Symphony's sister ship, Harmony, called "1887." In one scene, the theater goes pitch black and then 48 glowing drones hover above the ice, blinking and flying around to the music. In another, an incredibly real-like projection of a whale coming to the surface of the ocean in the arctic plays on the ice. Then there are "HiRO," a water acrobatics show with a terrifying high dive; Broadway's "Hairspray," with a below-deck orchestra; and glow-in-the-dark laser tag in a pitch black chamber. The most sought after new accommodation for families willing to splurge is the Ultimate Family Suite, a two-level, 1,346 square foot room that sleeps eight. 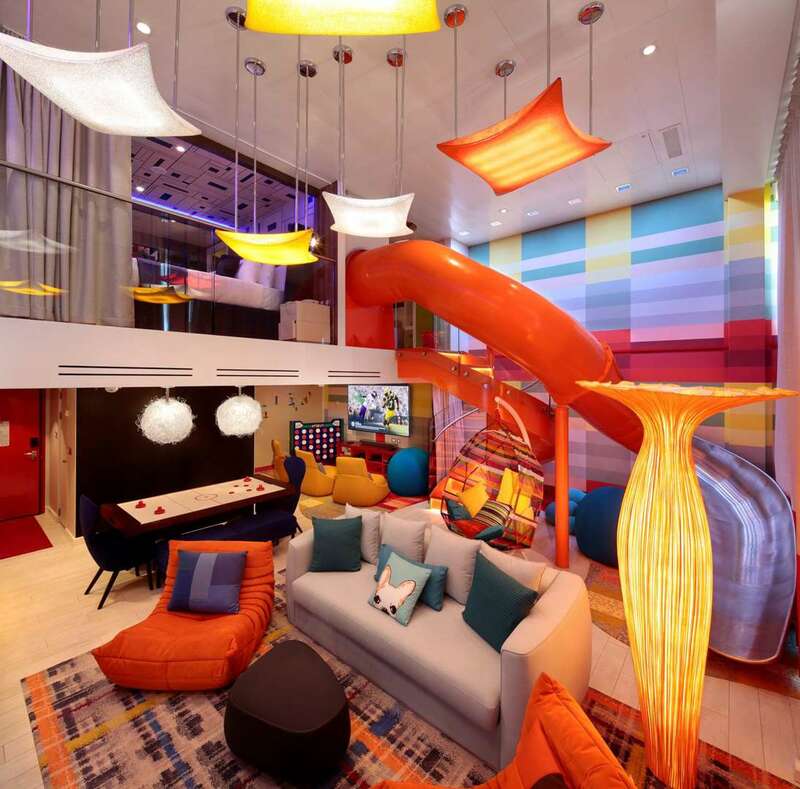 There's a bright orange slide from the second floor into the living room, a climbing wall and whirlpool on the balcony, a TV for each bunk bed in the kids' room and an air hockey table. "They just add things each time to make it more of a wow," said Gaye Stewart-Loudis, 68, from Davie, Fla., who has been cruising for 30 years. One week in the suite costs $45,000. For the week over Christmas, the price jumped to $80,000. The good news for families on a budget is that 1,802 of the ship's 2,775 staterooms have balconies. For even cheaper fares, guests can book interior rooms with "virtual balconies" that have screens programed to show you what the outside looks like in real time. Symphony of the Seas 'Dare to Dream' show. 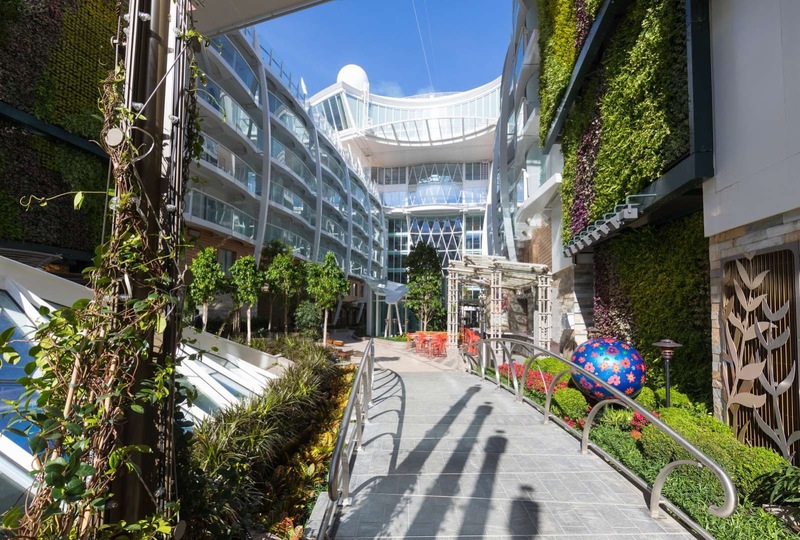 Similar to Harmony, Symphony is made up of seven "neighborhoods," making the ship feel less crowded. For those who want to get away from the action, the plant-filled, open-air Central Park area is lined with restaurants and park benches. For those who want a front seat to the action, the Boardwalk sits at the bottom of the 10-story tall Ultimate Abyss slide with a carousel and Johnny Rockets diner. A word of warning for those daring enough to try the Ultimate Abyss: keep your elbows tucked in close. Some people were missing skin when they got off. Foodies will be keen to try Symphony's new dining options. El Loco Fresh is a lunch spot on the pool deck offering tacos, burritos and nachos with a buffet of salsas. Playmakers is a sports bar in the Boardwalk area with plenty of TVs and beer on tap (the jacuzzis in the solarium also have TVs for die hard sports fans). Sugar Beach, also in the Boardwalk area, is a sweet tooth's heaven with every kind of candy imaginable. Hooked is a New England-style seafood spot. Symphony is the first ship of its size to make Miami its home port, thanks to the new Terminal A. Other Oasis-class ships have sailed out of Port Everglades. The disembark time - usually a grueling wait for cruisers - has been trimmed significantly because of the terminal's face recognition technology. Instead of interacting with a customs officer, each passenger simply has his or her photo taken and is given a green light to proceed or a red light for further screening. Most people zipped through. Symphony is now sailing seven-night eastern and western Caribbean trips from Miami.